Kallerians Polar PVC strip curtain remain highly soft even at 50 Celsius below zero, allowing easy passing of people, vehicles and goods and effectively preventing loss of cold air. Polar PVC sheet is a good choice for save power because they do not contain electric drive. Polar door curtain do not have action component and do not produce noise during service. Cool strip has been designed from market experience and has been proved in independent tests to up to 50% of energy costs, while helping retail chill cabinets meet statutory temperature controls. 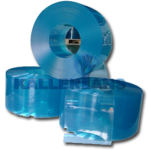 Kallerians Polar door curtain are available in a range of colors, such like pale green, pale blue and clear. Blue is the most popular color in usages. If you used in the dark environment, just like cold rooms, clear color is the best choice for you. Kallerians has three styles of PVC strip curtain, Smooth, Single Ribbed and Double Ribbed. The door curtain used is dependent on the applications. PVC strips with raised ribbing on both sides are available offering improved durability enabling them to withstand repeated impact from heavy traffic such as forklift trucks. Polar grade PVC strip curtains are an option for Cold storage, Refrigerated doorways, Deli-Counters, Chiller Cabinets, Cold rooms and most retail refrigeration situations. Usually 50% overlap, fixed stainless steel rail & hook on strips – either 200 x 2mm or 300 x 3mm.